Nose Work classes work on an exciting concept that allows participants of any skill level to join any class. Each class is a mixed group of different levels of experience which allows everyone to learn from each other plus there is less waiting to begin a class. Every search is personalized to the skill level of your dog so your dog always receives the challenges he or she is ready for. You can register whether you are new to Nose Work or you have taken one or more Nose Work classes and have a more experienced dog! Class size is limited to 6 dogs so don’t wait to register to secure your spot in this amazing class. Dogs have an amazing sense of smell and a natural desire to sniff, search and hunt. The sport of K9 Nose Work is designed dogs using their noses to develop your dog’s natural scenting abilities by using their desire to hunt and their love of toys, food and exercise. It’s a great way for your dog to have fun, build confidence, and burn lots of mental and physical energy. In this class we take your dog’s instinctual skill and teach them to use it to play games with their noses! 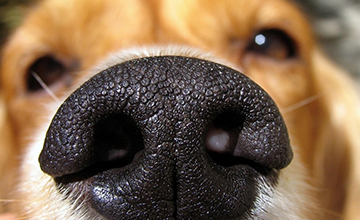 Your dog’s nose is about 100 times more sensitive than your own. A dog can detect 1 teaspoon of sugar in the water it would take to fill two Olympic sized swimming pools. Your dog is built to sniff. And what happens in your dog’s brain may be even more important. It’s here that dogs are able to discriminate between smells and components of smells, which can be further enhanced through training. Any human can teach it to their dogs. Any dog with a nose can learn it. NO prerequisites except dog must have a nose! The most amazing enrichment for your dog. Dogs LOVE to do this. You can do this work anywhere in any weather. Dogs get very satisfied and quite tired doing Nose Work. This is a sport suitable for just about any dog! Just about any person and any dog can do Nose Work! The art and practice of nose work is open to dogs of all shapes, sizes and ages, even young puppies and older, senior dogs. It has made basic search dog skills available to companion dogs, creating a new sport arena for dog enthusiasts. Not only has it proven to be a great activity for all types of dogs, but it is one of the most accessible activities for the widest variety of dog handlers regardless of previous training experience. No previous obedience work is required. This is a great outlet for reactive dogs – dogs who don’t usually do well in a traditional obedience class because of the close proximity to other dogs. Each Nose Work search is done without any other dogs present. As long as the dog isn’t aggressive toward humans (and not a resource guarder), he’s probably a good candidate for Nose Work Games. 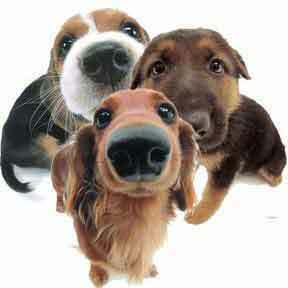 Nose Work may be started with young puppies (12 weeks and older). Puppies are the best instructors – expose them and watch them, they are all natural. It is also appropriate for dogs of all ages including older dogs and those whose physical health prevents them from doing more rigorous sports such as agility. Dogs in class cannot be resource guarders (protective of toys or treats by growling or snapping if someone comes near). One dog works at a time. Dog socialization is limited (crated between runs- don’t forget to bring yours, or rent one of ours! On cool days you may opt to leave Rover in the car instead of in a crate). Searches are individualized for each dog. Dogs can search for their favorite toy or treat. Dog-dog interaction is not an issue because all dogs are kept separate from each other and search individually when it is their turn, which allows dog-reactive dogs to participate. Generally, as time goes on, these dogs may become less dog-reactive. People-reactive dogs are not allowed in class for safety reasons. If your dog lunges, growls or snaps at other people, this is not the class for you. You must be able to provide a crate for your dog and bring it to class each week, or you can opt to rent one of ours and have it clean, set up and ready for you when you come to class (see below for more info). Crates keep the dogs safe and secure between their times to search and allows them quiet time to process what they are learning. Soft sided crates are the easiest to transport. If you would like a handout on crate training, please let us know! If your dog absolutely cannot be crated but can be tied and stay calm, we have one space in which to do so. Or, during cool weather, you may keep your dog in your car between searches. You can rent a crate from us for any or all of your class days. We will have it set up, clean and ready for you when you arrive. The cost is $15 per class but you will get a $5 discount per day if you rent for 4 classes or more. Please provide your own crate cover (a sheet or extra large bath sheet), and a crate pad or towel for your dog to lie on (if you choose). How we increase the challenges to keep the games fresh and exciting for your dog. In this innovative class you will teach your dog to findCheryl rewarding Molly’s successful search something specific. For example, in the beginning, he will learn to find a bit of food or a toy in a cardboard box among 12-15 other boxes! Then, he will search for the scent of the toy/treat among household items, increasing difficulty as we go and as your dog’s confidence builds. Some ways we make the finds more challenging include closing the flaps on the boxes, turning them upside down, hiding the box or household item inside of other items, and raise the elevation. Later the search is taken outdoors for a new experience for your dog. The dog is taught to search for a unique and precise odor (birch to begin) rather than just food. The dog learns to search for this odor and to ignore any other scents. The dog will learn to search in all kinds of environments for his primary reward, building strength in the search and having fun all the while. When odor is introduced, the dog has built confidence in searching and will have the endurance and desire to problem-solve because the hunting skill will have been built previously in Nose Work Games. In Intro to Odor the hides are made more challenging and additional environments and objects are added including an exterior vehicle search. Continuing where Level II left off, the searches become more challenging and an additional odor (anise) or two (maybe cloves) will be added. This level, as with all levels, are combined in one class so that your dog searches according to his or her abilities.